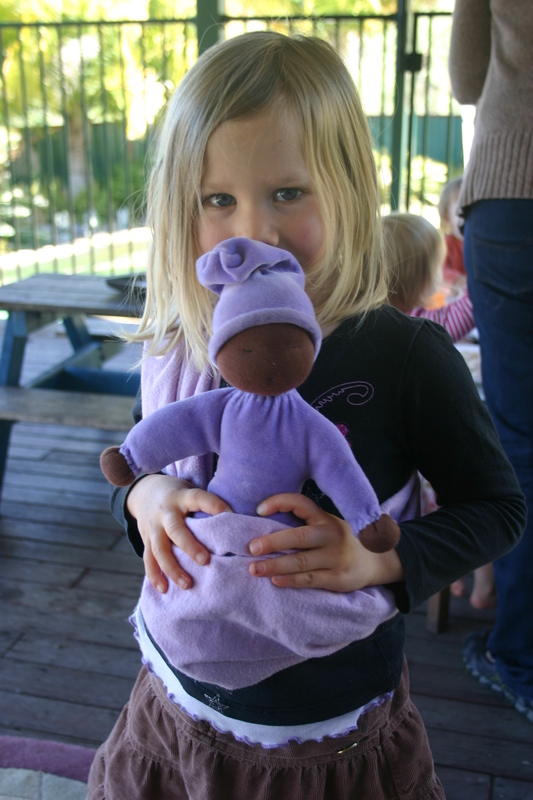 She has been shown all around our house, has been hugged, sung to (all new, original lullabies by Rosella! ), tucked in and put to sleep many times a day. She’s been to playgroup, soccer practice, school and the supermarket – tucked into the sling – and she has been safely buckled into the car many times. She has listened with enraptured silence to an endless stream of stories and succumbed to an overwhelming amount of attentive mothering. I am so glad to have had Lavender visit this week, her arrival has been perfect timing. Rosella had been feeling a little low recently, but Lavender, a most special friend, has really brought her cheerful, playful spirit back. 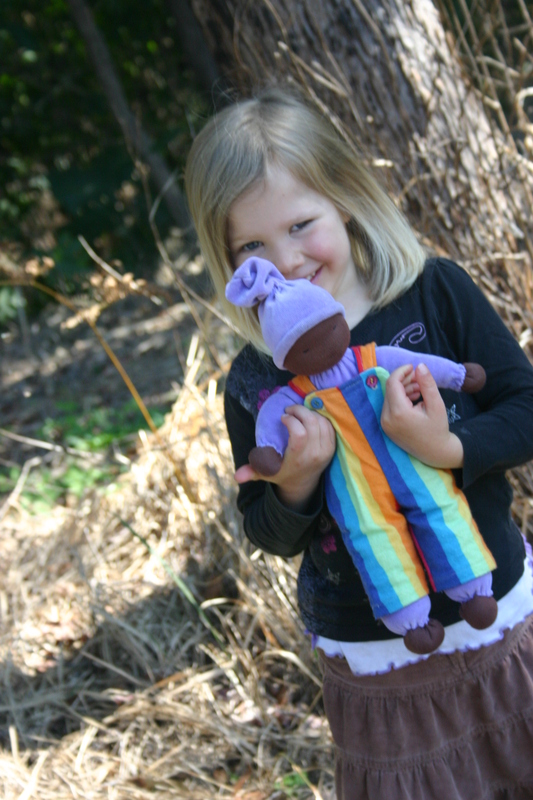 Lavender Baby has been made in the style of traditional Waldorf dolls: simple and uncomplicated. She sparked my thoughts again regarding the destiny and purpose of a doll. I’ve written a little about it before, however for some time I’ve wanted to write about the essence of the simple doll. Rosella’s thoughtful kindy teachers intentionally created her to be neutral. Her expression doesn’t betray her own feelings, but reflects those of the one she is with. We are referring to Lavender as ‘she’, because that is how Rosella has identified with her, however Lavender doesn’t mind being a ‘he’ either. That’s the beauty of the simple doll. They are so agreeable, so ready to be whoever you need them to be. Always there to be a mirror to your soul to help you experience your feelings from outside of you. How many toys these days are created to be a part of that flexible and responsive process of growth and learning? Every child needs at least one uncomplicated, neutral friend. This was the original intention behind the Waldorf doll-making movement. 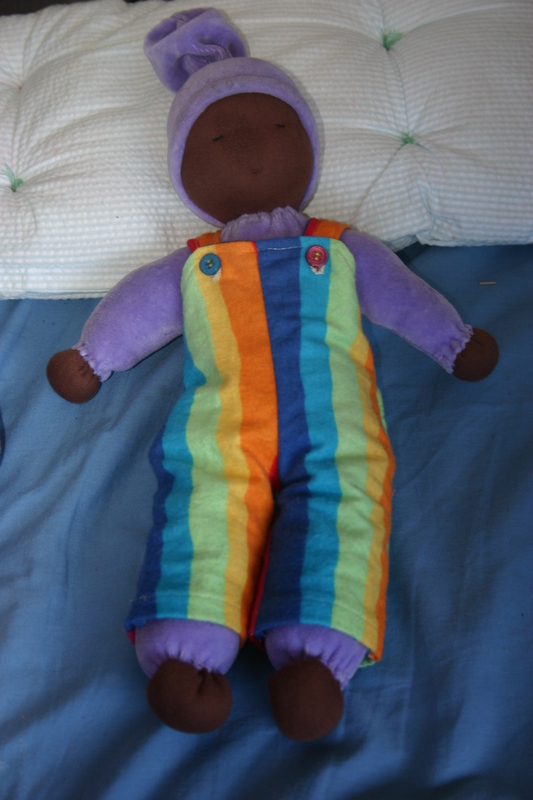 Dolls were made to be available to a child without making a statement about what that child’s hair or clothing should look like, what they should say, or what they should do. Lavender Baby is dressed head to toe in soft purple velour (comfort is important!) and she doesn’t have to worry about fashion or how her hair is arranged. She’s just there as she is for whoever needs her. Now, I’m not making a comment on whether it is right to have waldorf dolls with fashionable hair and clothes – I’ve made a few of those for sale myself – but I also do not believe that such dolls are as readily open and available to the child’s spirit in the same way as the simple doll. The waldorf doll market can be an expensive, competitive and consumer-based place, but at the same time it is still one worth a visit just to admire the exquisite work, from an adult perspective, put into many of these dolls. There are many beautiful dolls looking for a child to befriend. I just invite you to be conscious of your reason for purchasing. Of course you could make one yourself (it ISN’T hard!) Any time you want to buy or make a toy for your child I encourage you to ask: What is the essence of this toy? What need does this toy fulfill for my child? Will it serve my child’s inner world (growth, feelings, thoughts) or my child’s outer world (image, fashion)? Will it grow with my child as my child grows? We made Lavender Baby a pair of overalls to keep her clean when she played outside. Of course I know that it is fun just to buy stuff just because you want it, and I think this is less of a problem in terms of consumerism when our real needs (for example, our basic needs for health, acceptance, creativity, expression etc) are already fulfilled. This place of security allows us to then make good (and fun!) choices based on what we want, without being consumed by the need to have more. My good friend, parenting writer Amber Greene, recently drew my attention to this article: The Boy With No Toys. 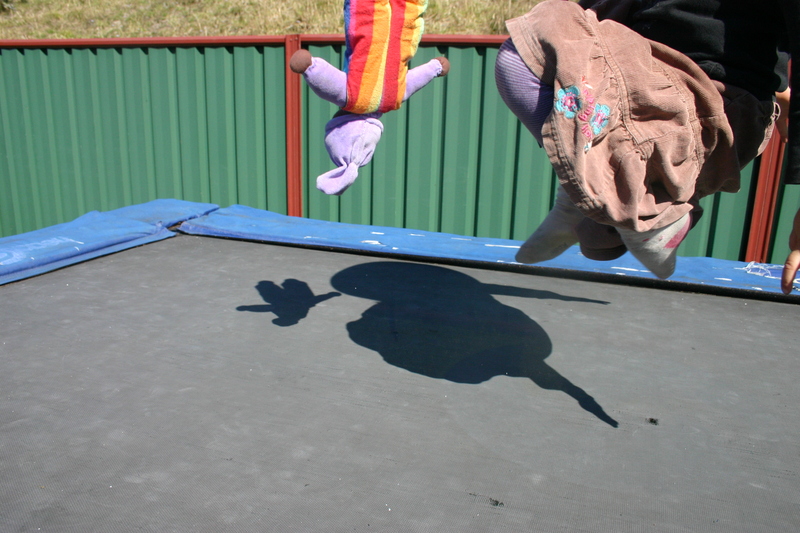 It is a great illustration of how simple playthings empower our children. The fresh abundance of joy, freedom, love and imagination that our unassuming Lavender Baby has released in Rosella has made me very aware of how much the simple things fulfill our needs faster than the fancy things can fulfill our wants. Lavender Baby, thank you for bringing us all some simple joy! gorgeous pic of a gorgeous girl!! Gorgeous writing and what a treasure Lavender Baby is – the new overalls are perfect for playing outside. Your delightful Jundi is loving living in Tasmania and she is an absolute treasure.